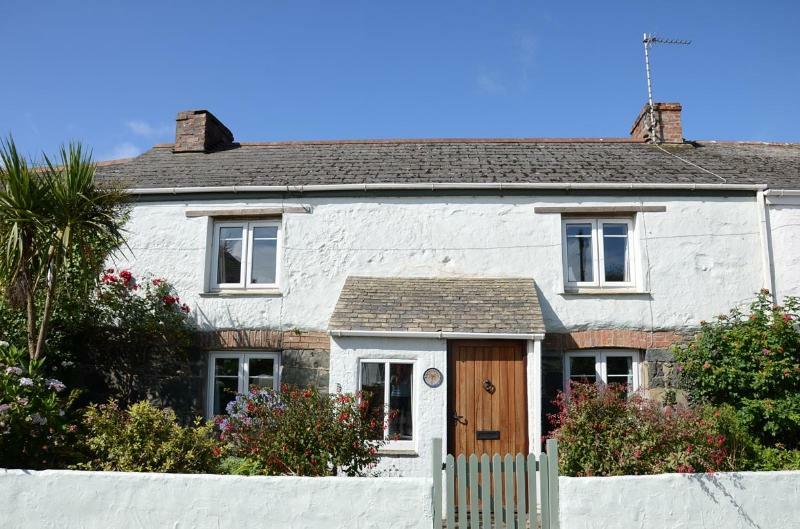 1 of 18A Cornish Palm tree and solid oak door welcomes you! Dogs are allowed only with prior consent from the owner and are subject to an additional fee of £25 per week per dog. 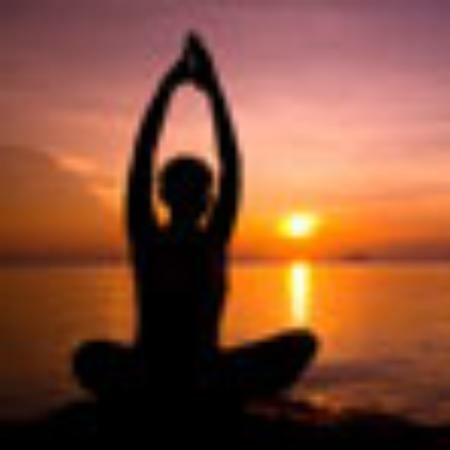 Guests are reminded that whilst bed linen is provided we ask that they bring their own towels. We do not ask for a Damage Deposit since we trust that our guests will respect the property and contents as if it were their own and would inform us should any accidental damage occur. Your deposit payment will be acknowledged and upon receipt of the balance when you will be informed about the precise location of the property and where to find the keys. We're experienced holiday-makers in Cornwall so we know how important it is to be prepared for the weather in throughout the year.. We are aware that one can enjoy an ice-cream on the beach in January or equally be swimming in the sea during a rainstorm in August! 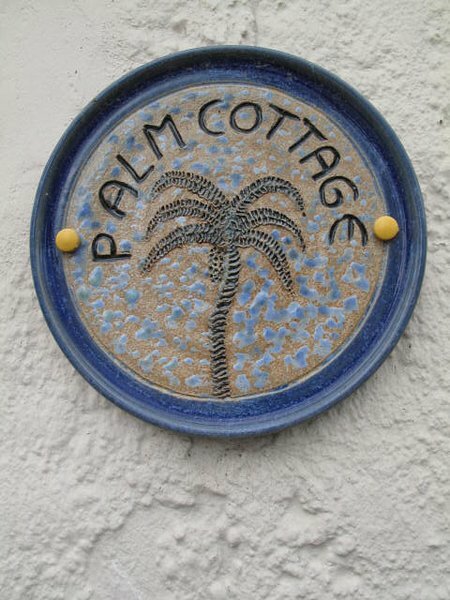 We can't guarantee the weather in Cornwall, but we do promise a happy holiday in our most comfortable home with a welcome tray on your arrival. From the imposing solid front door to the tiled floor vestibule you enter the beamed, open-plan, carpeted living area with its original cob walls. This room invites relaxation with its leather sofa, cosy chairs,open fireplace, window seats, several table lamps, board games, and flat screen TV. At the other end of the living room is a generous dining table, with a rocking and Windsor chairs, in front of an inglenook containing an attractive camphor chest, on top of which is an elegant locally-made stone lamp. There is a BT Home Hub connection providing free wi-fi and internet access. From the living room a couple of small steps lead up to the tiled floor hallway with the bathroom off to the left and to the right, a modern, very well equipped breakfast kitchen with a table seating six and windows overlooking the garden. Similar to the kitchen, the bathroom has a tiled floor plus extensive tiling above the generous bath with a shower over. There is also a wc, washbasin and a heated towel rail. The carpeted dog-leg staircase leads to the landing with a neat pine cupboard and a useful OS map of the Lizard Peninsula on the wall. Up three steps to the right of the landing is the large twin-bedded room, with a spacious built-in cupboard, which overlooks the garden. Off the landing to the left is the very pretty 'Beatrix Potter' smaller twin-bedded room, ideal for children, and which overlooks the palm tree and the village. The Master double-bedded room, at the other end of the landing, is also of a decent size and equally tasteful. There are a couple of built-in wardrobes and again is at the front of the house. Our large family have ensured that all five beds are very comfortable and have beautiful, freshly laundered linen, to hopefully facilitate a good night's sleep. The cottage is situated in a charming village with a pub over the road, serving local ales and excellent food at a reasonable price. A popular three miles circular walk is from Kestle Barton, brown signposted, down Frenchman's Creek to Helford and return through the wood. A foot-ferry from Helford runs across the river to Helford Passage. GUNWALLOE CHURCH COVE and KYNANCE COVE are the nearest beaches. HELSTON is a quaint old town famous for its annual Floral Dance and The Blue Anchor, one of the oldest pubs in England. POTHLEVEN has many shops and restaurants, an attractive Victorian terrace of houses and a working harbour. The Seal Sanctuary at GWEEK is one of only two in the UK and is certainly worth a visit. 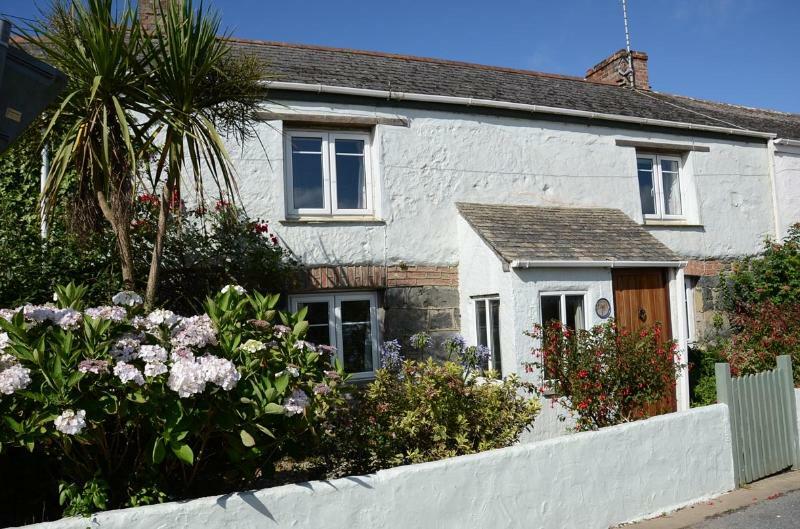 We advise that all guests have the use of a car whilst staying at Palm Cottage in order to explore this incredibly beautiful, unspoilt area of Cornwall. Flights from many UK city airports arrive into Newquay, which is then about an hour's drive to the cottage. The train is an excellent way to travel to Cornwall; overnight sleeper accommodation is available from London Paddington The nearest station is Redruth, half-an-hour away.